Browse: Home / Violent crime in Sweden is soaring. When will politicians act? For Swedes, this has become a familiar theme. Gun violence is on the rise, with daylight shootings and without regard for bystanders. In the past nine years, reported and attempted murders involving guns have almost doubled. 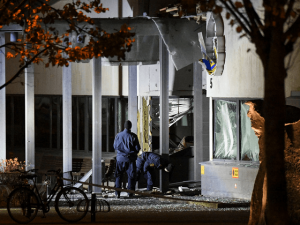 According to Swedish police, hand-grenade attacks (which were virtually unknown until a few years ago) are without parallel in countries not at war. The grenades — dubbed ‘apples’ by criminals — are smuggled into the country from former Yugoslavia. They are plentiful in the black market for weapons after the wars in the Balkans and are sold cheaply, or even handed out as freebies upon purchase of assault rifles. Stockholm police recently put a figure on it: less than £890 can buy you five automatic weapons and ammunition with 64 hand grenades as a sweetener. The grenades can, of course, be sold on. The street price in Sweden is about £100. Since explosives are not weapons to keep at home, criminals are likely to use them once they are in possession of them. Thus police describe hand-grenade attacks as ‘a trend’ among gangs in Sweden. Yet it’s still hard for Swedish authorities to be frank about what’s going on. It’s widely known that gang members are mainly first- and second-generation immigrants and problems are rampant in what police euphemistically refer to as ‘vulnerable areas’. Thus the gang wars serve as a constant reminder of Sweden’s failed migration and integration policies. This is a problem for the government (and even the opposition) in a country that prides itself on being a ‘humanitarian superpower’. And yet politicians, in government and opposition, seem particularly concerned that violence in immigrant suburbs is a PR problem, a threat to the image of Sweden, and that the remedy is spin. To that end, the Ministry for Foreign Affairs has launched a page on its official website, purporting to address claims that no one is making, such as ‘the high level of immigration means that the system in Sweden is on the verge of collapse’. No one says collapse; but charges of trouble or violence are hard to deny if you pick up a newspaper. Another official campaign says the ‘no-go zones’ are in fact ‘go-go zones’. Try telling that to Gordon Grattidge, head of the paramedics union Alarm/Ambulansförbundet. He once told me that members are not allowed to enter some Swedish neighbourhoods without police protection. Firefighters face the same reality. In November, some 50 cars were torched in a garage in a mainly immigrant suburb in Uppsala. Despite citizens repeatedly calling the emergency services, it took three hours before the fire department showed up — protected by police equipped with riot gear and machine-guns. Paramedics and firefighters are not the only ones who have to take precautions before entering ‘vulnerable areas’. The Stockholm suburb of Tensta had free parking for months after the area was deemed too dangerous for traffic wardens to enter. The Swedish Postal Service has for periods of time not been delivering packages to a crime-ridden neighbourhood in central Malmö. A number of public libraries have had to reduce their opening hours or even close temporarily in response to harassment by gangs of youths. After the latest explosions and shootings, Isabella Lövin, Deputy Prime Minister and leader of the Green party, turned her ire towards those who express alarm over violent crime in Sweden. How can anyone talk about chaos in Sweden, she asked. ‘The truth is that we are a country that gives the rest of the democratic world hope.’ She takes pride in running the ‘world’s first feminist government’ but she has made it a political priority to play down growing numbers of violent crime, rapes included. It’s a form of denial usually associated with non-democratic states or nations in decline. When it comes to dealing with the surge in violent crime, the government’s strategy seems less clear. There is currently an amnesty for guns, allowing criminals to hand them over to police without penalty in order to get some of the weapons off the streets. The government has also announced a plan for a hand grenade amnesty, but it’s unclear why radicalised gang members would return explosives. The Prime Minister, Stefan Löfven, even raised the prospect of sending in the army — which caused such a reaction that he quickly rowed back. He never did clarify exactly what the military could do that our police cannot. The Prime Minister’s wavering shows what happens when you fail to integrate immigrants and instead tolerate the creation of a society within a society: the police are unable to protect or to gather proper knowledge of these new communities full of people who tend not to speak the language. Representatives of the Swedish state — paramedics, social workers and even librarians — are met with aggression. This has led the Swedish police into an identity crisis of its own. Its officers have been the targets of a number of attacks, most recently explosions aimed at police in southern Sweden. Dan Eliasson, departing head of the national police, complains that investigations are made difficult because no one will talk to the police. The kind of social contract between state and society that leads citizens to help the authorities is not working in those parts of Sweden where police are seen as the enemy. The police’s language is often sympathetic rather than condemnatory. Linda Staaf, a police chief, has pointed out that grenade-throwing is dangerous because those who pull out the pin ‘expose themselves to a huge risk’. Jan Evensson, Stockholm’s police chief, also makes his case on compassionate grounds: ‘It’s hard to be a criminal. We want to help them get out of it.’ This famously soft approach once worked well in Sweden, but society has changed and the authorities have not kept up. For the political establishment, it seemed for a long time as if all this trouble might not affect everyday life for the Swedish middle class. That, too, may be changing. In the past weeks, children in the well-off Stockholm suburb of Nacka have been victims of robberies by masked gangs who are suspected of travelling from other parts of the city. Children as young as nine have been robbed at knifepoint. The outrage that followed the robberies in Nacka also serves as a reminder of how deeply divided Swedish society has become among lines of class and ethnicity. Nevertheless, two years later, a hand grenade went off in the apartment next door, killing British boy Yuusuf Warsame. After his murder, a teacher said: ‘It’s terrible to say, but we’re beginning to get used to it.’ In such neighbourhoods, this is the tragic reality: people are growing acclimatised to violence, in the way that the Swedish middle classes have not (so far) had to. They can afford to be philosophical about immigration and the new criminal trends, to ignore the problem and hope that it goes away. It’s safe to say, by now, that this has not worked. Whether Sweden’s political class can come up with a more effective solution is another question.